Is upon us. Winter still wants to dominate everywhere, but spring is trying to put out green shoots and birds are singing. Great time to relax and start those new projects. It so happens we have some great new designs on hand. We have added Just Nan to our list of designers and received WINTER TYPOGRAPHY, the second in a series of 4 seasonal small samplers. 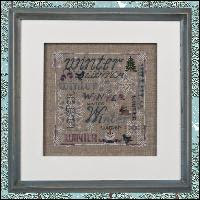 Featuring winter colors, this sampler also adds a snowflake charm as a great embellishment. 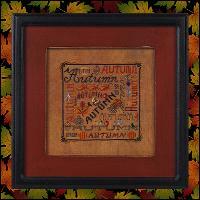 Also on hand is the AUTUMN TYPOGRAPHY sampler, the first in the series. Spring and Summer seasons still to come. HOPE OF THE HEART, from Silver Creek Samplers, keeps winter thoughts alive with this darling snowman who seems to be chatting with the bird on his arm. Stitched with Weeks and Gentle Art hand-dyed fibers, this is a great project to while away a winter evening. 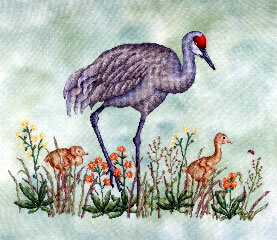 If you are looking toward spring, try SANDHILLS, the wonderful crane design from Crossed Wing Collection. Not only are the floss colors used vibrant and beautiful, but this is stitched on hand-dyed linen (Whispering Pine) created by the designer. Wonderful! 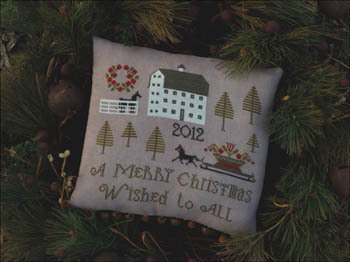 Earlier we told you about FARMSTEAD CHRISTMAS from Plum Street Samplers. 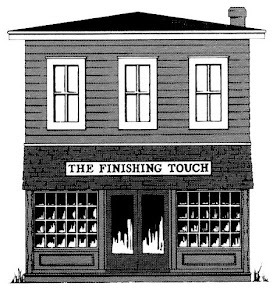 After waiting and watching, we now know it is on the way to our door. So, if you have been waiting for this one, give us a call. Thank you to all who joined us for a great Super Bowl afternoon and please mark your calendar for our next Sunday afternoon get together. We will be attending the Nashville market March 2 and 3. Our Market Sunday will be March 10 from 2-5 pm. Mark your calendar and join us to see what we carry home with us.